Jeff Mizanskey was freed September 1. At 1:30 a.m. on September 1, Jeff Mizanskey woke up in his prison cell at the Jefferson City Correctional Center after a brief nap. The 62-year-old had been in prison for nearly 22 years. But in six hours, he would be a free man. He couldn't fall back asleep. The seconds ticked by slowly. Guards came by every 90 minutes or so to shine a light on him and his cellmate. This was procedure, a way to make sure prisoners were still alive. Before, it had always bothered Mizanskey. It didn't matter today. As day broke and the prison began to wake, guards and inmates who had known Mizanskey for years came by to wish him well. "Only two more hours, Mizanskey," a guard said as Mizanskey walked down the hall. "You leaving already?" teased a fellow prisoner. After many hugs and handshakes, Mizanskey, sporting a bushy mustache and gray hair tied back in a ponytail, made his way to a waiting room where he would be formally processed out of the prison. The T-shirt waiting for him was something he couldn't be happier to wear: a black crewneck with the logo of the marijuana law reform group Show-Me Cannabis — a green and maroon pot leaf over the state of Missouri. Underneath were the words, "I'm Jeff & I'm Free." Around 7:30 a.m. the JCCC's guards walked Mizanskey toward the lobby. When he turned the corner and faced the front door of the prison, he was taken aback. "There were so many people and cameras everywhere, I almost went back inside," he says, laughing. "I didn't expect all those reporters, and I barely recognized my own family because I couldn't see their faces — they all had their phones in front of their faces!" Still, it wasn't difficult to pinpoint his family members — they were all wearing Show-Me Cannabis T-shirts, only theirs said, "#WeFreedJeffMizanskey." At the front of the crowd was Chris Mizanskey, the inmate's 37-year-old son, who had become the de facto family spokesman over the past two years. Mizanskey walked through the metal detector, no longer a prisoner, and hugged him. Both men cried as family and supporters applauded. And more family members held their arms open for Mizanskey: his older son Robbie, his brother Mike and many more. Surrounded by TV cameramen hovering inches from his face, Mizanskey walked outside, where a podium and microphone was waiting. He thanked his family, his supporters, Show-Me Cannabis and Republican state representative Shamed Dogan of Ballwin, who'd persuaded legislators to support his release. Mizanskey also condemned the sentence he believes he never should have received. "It's about time," he told reporters. "I wish they had done it fifteen or twenty years ago. I spent a third of my life in prison. One third. That's a shame. This is America. I just can't believe it happened." Mizanskey also pointed out that there are others serving excessive sentences for nonviolent drug offenses. "I finally made it to freedom," he said. "There's a lot of people in here that deserve the same thing." Over the past 22 months, Mizanskey has become the symbol of unjust sentences for marijuana use in Missouri. 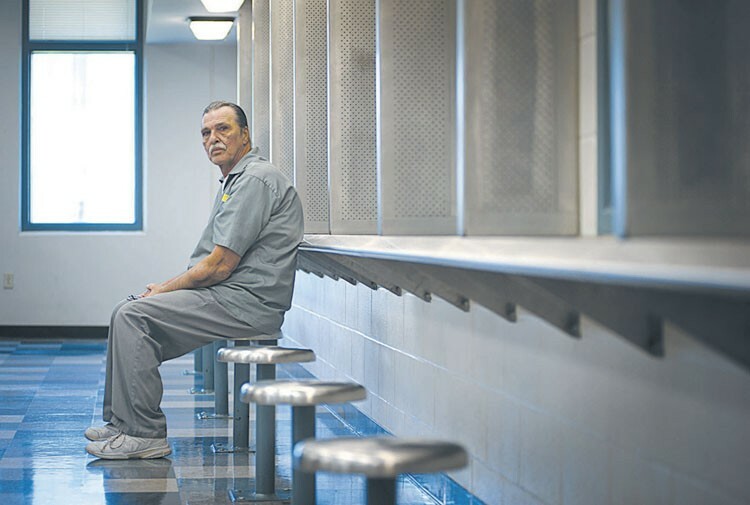 Punished under a draconian three-strikes law that allowed life without parole for three drug felonies, Mizanskey was the only prisoner in the state serving that sentence for marijuana-only crimes. As his case became known, his story drew enough sympathy and anger to propel activists and concerned citizens to petition Governor Jay Nixon to grant clemency. Those efforts failed, but they triggered thousands of phone calls and letters to the governor and grabbed the attention of Dogan, who pushed legislation to free Mizanskey. Dogan's bill never got to a vote, but it succeeded in getting many lawmakers from both parties to vocally support Mizanskey's release. Eventually, Nixon had to do something. And in August the governor commuted Mizanskey's sentence, making him eligible for parole. Things moved quickly after that. Mizanskey's release was a bittersweet victory for a man who just recently became a great-grandfather: He's out of prison, but he can't help but think about the 21 years of his life he spent there, all for three relatively minor marijuana busts. Jeff Mizanskey, photographed at the Jefferson City Correctional Center in 2013. In the summer of 1994, O.J. Simpson was fleeing LA in that white Bronco, Michael Jackson married Elvis' daughter, and Forrest Gump was in theaters, causing America to recite annoying catchphrases like, "Life is like a box of chocolates — you never know what you're gonna get." But Jeff Mizanskey was figuring out his first few days in prison — a place he was slated to remain for the rest of his life. After a couple of transfers between prisons, the Missouri Department of Corrections decided Mizanskey, then 41, would serve his sentence in "The Walls," the decrepit Missouri State Penitentiary in Jefferson City. First opened in 1836, it was most famous for once housing James Earl Ray, who escaped in 1967 and wasn't heard from again until he assassinated Dr. Martin Luther King Jr. on April 4, 1968. By the time Mizanskey arrived, the prison was a moribund, concrete shell that housed much more than prisoners. "The first night in my cell, I got up on the top bunk, looked up, and saw that the ceiling was moving," Mizanskey recalls. After a few moments of staring at a flickering glob of black dots, it became clear: "The ceiling was completely covered in roaches." Mizanskey's requests for an exterminator were politely ignored by prison staff, so he decided to do something about it on his own. All he needed was some baby oil. "I put some baby oil in a paper cup and stuck a little piece of food, something sweet, in the middle," Mizanskey says. "And I placed that cup on a shelf and roaches would go in it, but then got stuck. When it was full, I put them in the toilet. I'd say about three or four hundred roaches a day." But no matter how many roaches succumbed to the baby oil, more would come in through the walls of the crumbling penitentiary. Because prison staff wasn't about to fill in any cracks, Mizanskey obtained an extra tube of toothpaste and did it himself. To kill the remainder of the roaches, Mizanskey put laundry sour — a combination of acids used in industrial laundry centers — around the cell. In those early days of confinement, however, Mizanskey had another, much bigger problem: The other inmates didn't believe him when he said he was doing life just for weed. "You had to have done something else — what did you do?" they would ask. Suspicions would arise: Had he done something violent? Were children involved? There had to be more than just pot. "I got in a few fights over it — some people just didn't believe it," he says. "I guess I can't really blame them for that." Mizanskey's status as a lifer for drug offenses drew the attention of some prison dealers who wanted him to help smuggle drugs in via a dirty guard. Mizanskey refused — and was beaten for it. The guards wanted to know who did it, but Mizanskey refused to tattle. "I told them it was a handball accident and that there was no problem with anybody," Mizanskey says. "But that wasn't what they wanted to hear." He landed in the hole. A few days turned into a few weeks; Mizanskey says he spent about a month in solitary confinement for not giving more details about the supposed handball incident. Once prison officials realized he wouldn't divulge any information, Mizanskey was let back into general population. "I didn't snitch, so the guys who beat me up knew I was OK, but they still wanted me to do their drug-muling thing," says Mizanskey. He again declined the invitation — not only did he risk more time in solitary if he was caught, but, at the time, he still figured that he had to somehow have some chance at parole. He couldn't jeopardize that. A member of the drug crew who was in prison for a triple murder decided to make one last pitch using the hardest hard-sell technique. "He showed me a shank and said if I didn't do it, he was gonna kill me," Mizanskey says. Mizanskey still didn't go to the guards — that could make things worse in the long run. Instead, he watched his back and tried to stay clear. And then luck struck: The convicted murderer overdosed and was found dead in his cell. "After that, the drug crew let me be, found someone else," Mizanskey recalls. Mizanskey settled into prison life by working at furniture factory inside the prison. Desks, chairs, bookcases, even the podiums that politicians speak from are made at the prison's furniture factory, which relocated (along with Mizanskey) to the newly built JCCC in 2006. A skilled construction worker and supervisor before he was locked up, Mizanskey was promoted to foreman, teaching and supervising workers. 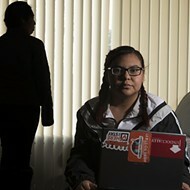 "A lot of people that I taught never had a job before, and they didn't know how to work," Mizanskey says. "That's probably a big reason why they ended up in there in the first place. 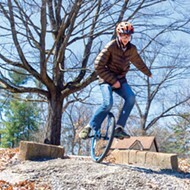 But a lot of them learned to like it, and they learned some skills they could use." Although he worked full-time in prison for two decades and led crews, Mizanskey never made more than $1 an hour. That's even though the state sells its prison-made furniture to government offices for lucrative amounts — the going rate for an 84-inch-wide "Judge's Collection" executive desk is currently $1,500. But among the friends he made were his supervisors — the civilians who help run the factory for the state of Missouri. That includes Tim Allgaier, who worked with Mizanskey for the past three years. "I was amazed how Jeff could take these guys who had no experience in furniture finishing and teach them how to stain and mix colors," Allgaier says. "He ran his shop like it was his own business. He found ways to save materials, and cut back on cost — even though it was a prison and it wasn't his money, it was state money." Allgaier and other supervisors advocated for Mizanskey's release with letters to the parole board. And on the day Mizanskey was released, Allgaier was there to congratulate him. "He's a good man," Allgaier says. "He won't recidivate. He'll probably just get back to work." Chris and Mike Mizanskey organize media contacts who've asked to speak with Jeff. Over the years, in between factory shifts, Mizanskey worked on appeals. They proved a series of letdowns, climaxing when he learned that his sentence came without the possibility of parole. The unusual sentence was an extreme result of Missouri's unusual three-strikes law. Under the state statute, a person with three drug-related felonies can be subject to a minimum of ten years and a maximum of life in prison without parole if a prosecutor chooses to charge him as a "prior and persistent drug offender." According to the American Civil Liberties Union, no other state in the country has a drug-specific three-strikes law. All three of Mizanskey's felonies had been for marijuana and had come over the course of ten years. In 1984, he was busted for possessing a half-pound and selling an ounce. In 1991, police searched Mizanskey's home after an informant said he was carrying. Police only found two ounces, but anything more than 35 grams is a felony in Missouri, and Mizanskey got his second strike. The third and final strike came in December 1993 when he drove a man to a hotel to check out a seven-pound brick. The man, Atilano Quintana, was a known drug dealer — but unbeknownst to either him or Mizanskey, he was being set up by two men working with Sedalia police. The men had been busted with close to 100 pounds of pot the day before and claimed they were bringing it to Quintana. In return for helping the police get Quintana, the two were promised leniency. Sergeant James Wingo, the highway patrolman who organized the Quintana sting and watched it go down via a hidden camera, told the Riverfront Times in 2013 that Mizanskey was there in a supporting role for Quintana. "You do a dope deal, you bring your extra hand around," Wingo said. "For lack of a better word, [Mizanskey] was his 'helper,' I guess." Mizanskey first filed for post-conviction relief in 1997, arguing that his attorney at trial had been ineffective because he did not object to his client being sentenced as a "prior and persistent drug offender." The motion was denied in March 1999. A year later, Mizaskey's public defender tried to get the Missouri Supreme Court to hear the case. He argued that the original attorney had failed to call a key witness and failed to object when the prosecutor referenced damning details about Quintana's drug activities. After all, Mizanskey was only on trial for his involvement in one transaction — the six pounds in the hotel room. But the court declined to hear the case. Mizanskey filed another appeal the next year. Yet again, he was denied. Mizanskey attempted a final shot in 2010 when he filed an appeal arguing that Theodore Scott, the Benton County judge who'd sentenced him, didn't intend the sentence to be life without parole, and that a clerical error was responsible for what was arguably the harshest drug sentence in the nation. After all, Scott never said in court that the sentence was to be "without parole" — he said only that Mizanskey had to serve a life sentence, which is typically treated as 30 years, allowing a parole hearing as early as 2005. But in the paperwork filed after Scott handed down the sentence, a clerk checked in the "without parole" box. In April 2011, the appeals court denied Mizanskey again. There just wasn't enough proof, the judge concluded, that Scott didn't intend for Mizanskey to die in prison. There was nowhere else to go but the governor of Missouri. In early 2012, Tony Nenninger, a lawyer and cannabis activist based out of Columbia, attended a town hall hosted by Show-Me Cannabis. That's where he met Chris Mizanskey, who told him about his father's egregious sentence. Nenninger has told the Riverfront Times that he was flabbergasted and looked into ways he could help. Ultimately, he advised Mizanskey to seek clemency from Governor Nixon. In March 2012, Mizanskey filed an application for clemency. He seemed like the perfect candidate for the rare privilege: He was in prison for nonviolent crimes, he had worked steadily in prison and completed every single rehabilitation program on offer — drug counseling, self-improvement, you name it. In addition, selling marijuana is no longer considered a crime in Colorado and Oregon (with the proper documentation, of course), and Oregon and Alaska have recently passed legislation to join the trend in the next few months. Public attitudes toward weed have shifted dramatically, with legalization on the rise in several states and quite possibly the country. Even Missouri may soon consider some sort of medical-marijuana initiative. Still, Nixon would not be an easy sell. The governor — who had previously been the state's attorney general — had never once granted clemency since taking office in 2009, and a backlog of several hundred clemency petitions sat unanswered. Months passed without action. Then, in October 2013, Nenninger wrote a short blog post about Mizanskey's case on the National Cannabis Coalition website. The post urged readers to send letters to Nixon asking for clemency. "It is rare that a case gets enough of a governor's attention to be seriously considered," Nenninger wrote. 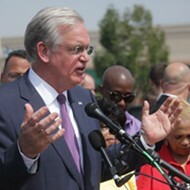 "However, like all politicians, Governor Nixon will notice if enough citizens call a political issue to his attention." Four days later, the Riverfront Times published a story about the case that got picked up by several national news organizations. 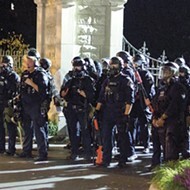 Online comments showed a mix of mostly outrage and disbelief. And Show-Me Cannabis decided to make a push to persuade Nixon to grant clemency synonymous with its effort to reform Missouri's marijuana laws. "We did about 40 town hall meetings in 2013 and 2014," says John Payne, the executive director of Show-Me Cannabis. Crowds ranged between 50 and 200 people, many of them interested in Mizanskey's case. The first question was, 'What can we do to get this guy out of jail?'" Payne says. "People had a very profound sense of injustice when they heard about the case, and they wanted to do something to right that wrong. 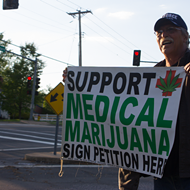 It definitely became a cause célèbre among cannabis activists in Missouri everywhere we went." Via Facebook, Show-Me Cannabis posted photos with an invitation to take action. Anybody who texted "Jeff" to the easy-to-remember "420420" would get alerts to call the governor's office. The simple social-media campaign prompted more than 800 calls in its first few months alone. "That may not seem like a whole lot for the entire state of Missouri, but in politics, a few phone calls could mean quite a lot," Payne says. 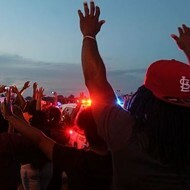 The texts primarily came from Missouri, but people from around the country chimed in, especially whenever a news story about the campaign spread through social media. Mizanskey's story made it to the front page of Reddit a few times — "whenever that happened, the texts spiked," Payne says. Five months after Mizanskey's story first hit the Internet, Show-Me Cannabis came up with a new idea to garner support: billboards. A story about the plan rose to the top of Reddit, garnering another round of national and international attention. The organization raised more than $10,000 to publicize Mizanskey's case. 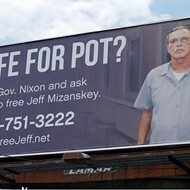 Billboards near Sedalia and in Jefferson City questioned the sentence — "Life without parole for cannabis? It's time to fix our unjust marijuana laws" — and asked people to call Nixon and demand Mizanskey's freedom. But the governor, whose own son had been arrested for marijuana possession in 2011, was still silent. From CNN to local TV news stations and even a German news crew that flew in from Hamburg, Mizanskey was by far the most visited prisoner at the JCCC. The inmate told his story to whoever was willing to make the drive to No More Victims Road, the ironically named location for the new Jefferson City Correctional Center, which replaced The Walls in 2006. And while Mizanskey spoke out about the injustice he felt he had suffered, he also was honest about his views on marijuana, refusing to temper his beliefs to make his cause more palatable to Missouri politicians. He praised marijuana's medical benefits, telling journalists that it's safer and less addictive than alcohol and prescription painkillers. He also said repeatedly that if he got out, he would join the marijuana-reform cause. The biggest victim of Missouri's marijuana laws became the most vocal advocate to change them. Mizanskey's words were having an effect. When RFT spoke to the prosecutor in Mizanskey's case, Jeff Mittelhauser, in November 2013, he insisted that the sentence was appropriate and felt no regret for asking the judge for life without parole. 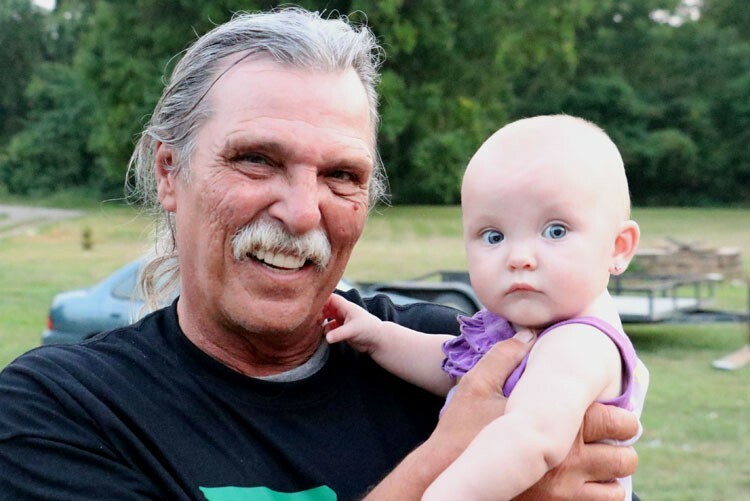 But by the spring of 2014, after Mizanskey's story was told by news organizations around the country, Mittelhauser, who was then running for judge in Pettis County, told a Kansas City TV station that he supported clemency. As Mizanskey did more interviews, his son Chris was also becoming a polished spokesman for the family. A good-natured 37-year-old bar owner who lives on the same street he grew up on in Sedalia, Chris told the story of losing his father at a young age to the criminal-justice system, bringing home the message that draconian prison sentences affect entire families. Media reports would often note that Mizanskey had become a great-grandfather. Other family members assisted, too. Amber Ward, Mizanskey's niece, ran the Free Jeff Mizanskey Facebook page, which accumulated several thousand likes. She also had bumper stickers and T-shirts made. And soon Mizanskey's brother Mike would come down from Chicago to help with the effort that would ultimately lead to Mizanskey's release. Mizanskey with his great-granddaughter, Aria McReaken. State representative Shamed Dogan of west St. Louis County, first heard about Mizanskey's plight like most everyone else: online. 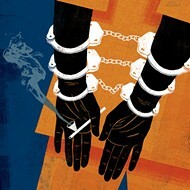 Like many, he had trouble believing Mizanskey was in solely for marijuana convictions. But when Dogan confirmed that the stories were true, he had options that other sympathetic readers did not. His first course of action was to see if he and other lawmakers could get Nixon to grant clemency. When they, too, were ignored, the Republican decided to legislate. In February 2015, Dogan announced HB 978, which called for the release of any Missouri inmate serving life without parole for nonviolent, marijuana-only charges. In other words, Jeff Mizanskey. "It is unconscionable to me that this man, who is no danger to society, will spend the rest of his life in prison at taxpayer expense," Dogan said in a press release announcing the bill. "Many of my legislative colleagues have come together to implore the governor to commute Mr. Mizanskey's life sentence, but to date the governor has done nothing more than promise to review Jeff's case before he leaves office. I appreciate the governor's willingness to eventually take interest in this case, but the time for justice is now. My legislation would allow immediate action to be taken so that this miscarriage of justice can be rectified and Jeff Mizanskey can again be a free man." Calling out Nixon in the press release was intentional. The bill's true purpose, Dogan admits, was to push the governor to grant clemency. On April 28, Dogan, members of Show-Me Cannabis, and Chris Mizanskey held a joint press conference at the Missouri statehouse to announce that they were about to deliver 390,000 signatures from a Change.org petition that asked Nixon to give clemency to Mizanskey. Started by Chris in early 2014, the petition got a great deal of attention, including mentions in the BBC and a tweet from Senator Cory Booker, a Democrat from New Jersey. During the press conference, a reporter asked Dogan about his pending bill. "You don't hear legislators say this very often, but I really don't want my bill to pass," he said, only half-joking. "It would be wonderful if the governor took this bill out of consideration and grant clemency tomorrow." Over the next few weeks, Dogan's bill gained wide acceptance in the Missouri House, most notably from Representative Paul Fitzwater, a powerful conservative Republican from Farmington who chairs the House Corrections Committee. He personally traveled to the JCCC to meet Mizanskey. "I was blown away when I met Mr. Mizanskey," Fitzwater explains. "Here was a man who had done everything he could to rehabilitate himself, he had been working the entire time, and he didn't deny he did wrong. But most of all, I was amazed that in 22 years of being in prison, he had only been written up twice: Once for a dirty cell, and once for putting a letter in the wrong mail slot. I've been involved in corrections for a long time and that's remarkable. The man was a model prisoner and had clearly been rehabilitated." Fitzwater quickly scheduled a committee hearing. The hearing took place inside a gray-walled room in the state capitol with Mizanskey supporters and family members facing the twelve-member committee. In between sat Dogan, who made his case for Mizanskey's release. After citing Nixon's refusal to act, Dogan explained: "I wrote this bill to save taxpayers money and to right an injustice that was done to Mr. Mizanskey." Fitzwater then implored committee members to look at the bigger picture. "The prison population has increased to over 33,000 in the state of Missouri," Fitzwater said during the hearing. "The question is: Do we build a new prison, or do we find ways to put some of these nonviolent criminals that are behind bars with long sentences back on the street and make them citizens again? This is a serious question that we have to address." There wasn't much argument. Several committee members voiced support, including Republican representative Justin Hill, a former undercover narcotics officer with the St. Charles County Drug Task Force. "As somebody that has pretty extensive experience in narcotics investigations from working with the DEA and drug task forces, this marijuana charge does not fit the sentencing," Hill said. "I've charged people in federal court with a thousand pounds of marijuana and they got quite a lesser sentence than this. This is very excessive." Representative Penny Hubbard, a Democrat from St. Louis, added: "I've been in corrections at the state and local level for 30 years, and I've never seen a sentence like this. I'll be supporting the bill." And then Mike Mizanskey, Jeff's 57-year-old brother, nervously read a moving statement to the committee about the impact Mizanskey's incarceration has had on the family. "The saddest and most heart-wrenching thing I had to do was travel from Chicago to the Jefferson City Correctional Center to be with my mother, who was dying of cancer, so she and Jeff could say their final good-byes. 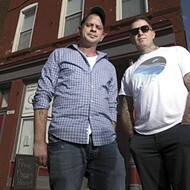 That broke Jeff's heart," Mike said, wiping a tear from behind his eyeglasses. "I am now fulfilling my mother's last words before she passed. She made me promise to be committed to getting justice for Jeff. That's why I'm here today." The bill passed committee 11 to 1, and looked like it would pass in the full chamber — it had bipartisan support and even greater support from the public. Maybe Nixon wasn't necessary after all. Yet resistance seemed to be building, for reasons that aren't entirely clear. Payne, of Show-Me Cannabis, says that several lawmakers were concerned with the bill's constitutionality. Another source who has worked extensively in the Missouri House says that some Republicans didn't want to vote yes on the bill, but they also didn't want to look bad by voting against it. They apparently told the speaker not to allow a vote. When HB 978 did not make it to a vote before the session ended May 14, Mizanskey's best chance for freedom was over, just like that. "I was crushed. I thought that was it," recalls Mizanskey. Show-Me Cannabis urged supporters not to give up. There's always the next legislative session, and this time they knew they had support from many lawmakers. Maybe a few more could be convinced. But finally, on May 22, Nixon did something. It wasn't clemency, but it was the next best thing: The governor commuted the 62-year-old's sentence, making it possible for Mizanskey to be paroled. "The executive power to grant clemency is one I take with a great deal of consideration and seriousness," Nixon said in a press release. "In the case of the commutation, my action provides Jeff Mizanskey with the opportunity to demonstrate that he deserves parole." After almost 22 years in prison, Mizanskey would finally have the possibility of parole. And while getting parole was certainly preferable to staying in prison, it also meant that Mizanskey would not be completely free: He'd have to report to a parole officer on a regular basis, see his travel restricted, and have to piss in a cup under the watchful eye of the state of Missouri. "Nixon should have just granted Jeff clemency, but as usual, he's unwilling to take action," Dogan says. "I was very disappointed, but I can't say I was surprised." Payne felt the same way. "It was a very Nixon thing to do," said Payne. "He just kicked the decision over to the parole board so he wouldn't have to make a decision. That's right out of the Nixon playbook." Few doubted that Mizanskey would be granted parole. Show-Me Cannabis kept pushing, rallying its supporters to write letters to the parole board during the lead-up to the August 6 hearing. That morning, Mizanskey made his case one last time. The parole board told him it could be six to eight weeks before they'd rule. But less than two weeks later, on August 20, they gave him a decision. 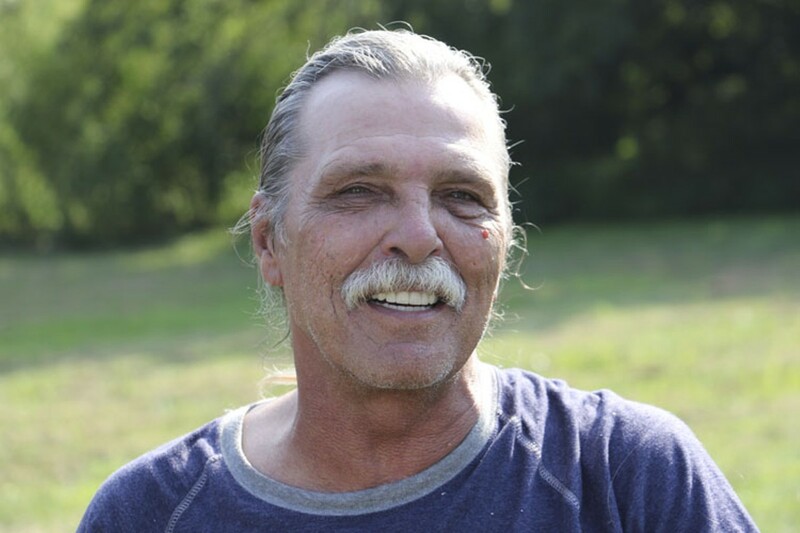 On September 1, 2015, roughly three months shy of his 22nd year in prison, Jeff Mizanskey would be released. "I just can't believe it," Chris Mizanskey tells the RFT. "It's surreal. Finally. They're finally gonna let him out." 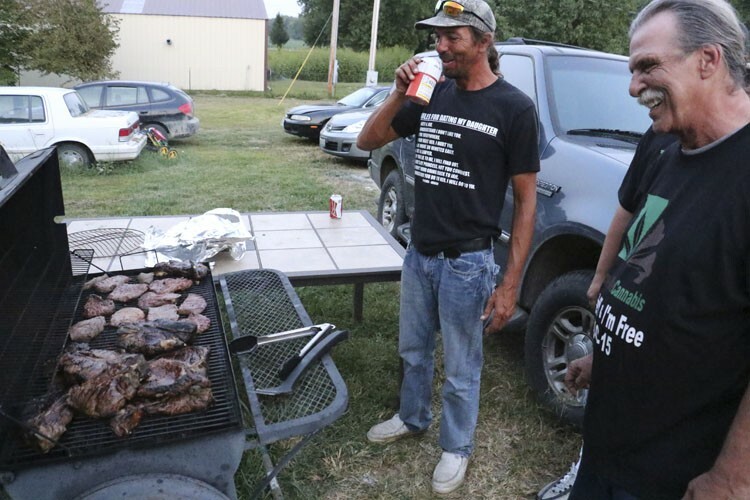 Mizanskey after his release, barbecuing with son Robbie. Spend more than two decades of your life in one place, and you make close friendships, even in prison. The eleven days between the announcement of Mizanskey's release date and his actual departure featured numerous teary good-byes. One of those good friends was his cellmate for the last few years, Neldon Neal. The 68-year-old Springfield man is currently serving a 16-year sentence for voluntary manslaughter after shooting his wife while intoxicated. His story got some press after he eluded police for 62 days before finally getting caught hiding in the Mark Twain National Forest. "He might have been more excited for me than I was for me," Mizanskey says jokingly. "Every day he'd say how many more days I have to go, how many hours, that kind of thing. Lots of people were doing that. It was like a big countdown. Even some of the guards were saying things like, 'Just five more days, Mizanskey.'" Some friends he never got to say good-bye to, including Floyd Newberry. Newberry murdered his wife in 1976 for insurance money — and while he actually had the possibility for parole, he had to serve 50 years of his sentence first. He didn't make it, succumbing to cancer two weeks before Mizanskey's release. Mizanskey did time with a lot of people who committed horrible crimes, but when you're serving a life sentence in prison, you befriend the people who surround you. And watching friends die behind bars was a grim reminder of what would happen to Mizanskey if he never got out. "It's hard to get medical treatment in prison," he says. "You have to go through so much bureaucracy just to get help, and even then you might only get to see a nurse practitioner instead of a doctor. If I got seriously ill, who knows what would happen to me? I suspect they'd just let me die, too." A few days after his release, Mizanskey points to the baseball-sized tumor on his left forearm as proof. "I couldn't ever convince them to take this out. I've had this for years, and it has just gotten bigger. They just tell me it's fine, don't worry about it — but it's kinda hard not to worry about." 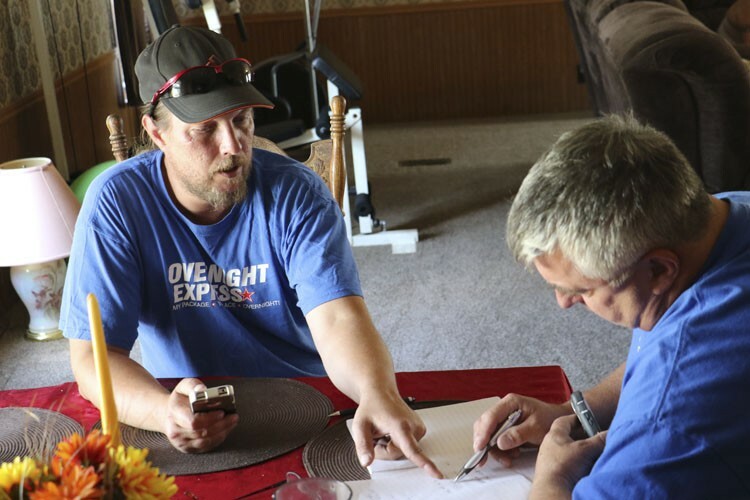 Freed from prison just twelve hours ago, Mizanskey sits at the kitchen table in the home of his oldest son, Robbie, on the outskirts of Sedalia. He has more he wants to say about prison — ways to improve it, ways to keep people like him out of there — but Robbie, a lanky sheet metal crew supervisor, takes his father's mind off all that. "Look at this, Dad," Robbie says, revealing a tray of thick, lightly seasoned steaks, ready to go on the grill outside. "Oh, man — that is beautiful," Mizanskey says with a grin. "And this one's yours," Robbie says, pointing to the biggest cut on the tray — a gigantic T-bone about a foot long and three inches thick. It must weigh at least two pounds. 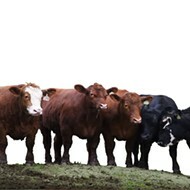 Robbie raises cattle on the side and told his butcher to cut a special steak for his father. Mizanskey laughs. "I ain't gonna be able to eat all that, but I guess I can try." As Robbie takes the steaks outside, his wife, Jennifer, sets the side dishes on the table. Among them is a neon green pasta and vinegar dish that Mizanskey's brother Mike brought from a restaurant in Chicago. It was a childhood favorite of Mizanskey's, who grew up in the Windy City, and he can't remember the last time he had it. As dinner is being prepared, Chris and Mike go over a list of media interviews lined up for Mizanskey over the next few days. He'll have a lot to do — more family to meet, a party, and an invitation to a suite at Busch Stadium to watch the Cardinals take on the Cubs. "You sure you don't wanna hold off on some of these interviews just for a few days to relax?" Mike asks. "No, I want to get the word out while I can, help the movement," Mizanskey says. "There's some momentum, and it's good to talk about this now." He means it. Mizanskey has often said that it wasn't the courts that helped him; they only hurt him. Rather, it was the work of activists, including his family, that forced Missouri politicians to look at the serious problems with the state's drug laws. "We need to do find alternatives to throwing people in prison for these nonviolent crimes and releasing people like Jeff, nonviolent criminals who have nothing more to gain from being in prison," says Rep. Fitzwater, who plans to invite Mizanskey to the state capitol to meet other lawmakers and talk about alternatives to prison for drug offenders. Outside, Robbie mans the grill and flips the steaks, giving special attention to the gigantic slab of meat. "I was about nineteen or twenty when he got locked up," says Robbie, now 42. "When they said life in prison, I didn't even know what to think. I can't even describe it. It's horrible." Jennifer comes out to check on him. Before she heads back inside, she turns around and says, "Hey, Robbie — your dad's home for dinner." Ray Downs is a former staff writer for the Riverfront Times. He first wrote about the Jeff Mizanskey case in October 2013.